Medicinal plants are used by 80% of people from developing countries to fulfill their primary health needs, occupying a key position on plant research and medicine. Taking into account that, besides their pharmaceutical importance, these plants contribute greatly to ecosystems' stability, a continuous documentation and preservation of traditional knowledge is a priority. The objective of this study was to organize a database of medicinal plants including their applications and associated procedures in Canhane village, district of Massingir, province of Gaza, Mozambique. In order to gather information about indigenous medicinal plants and to maximize the collection of local knowledge, eleven informants were selected taking into account the dimension of the site and the fact that the vegetation presents a great homogeneity. The data were collected through intensive structured and semi-structured interviews performed during field research. Taxonomical identification of plant species was based on field observations and herbarium collections. A total of 53 plant species have been reported, which were used to treat 50 different human health problems. More than half of the species were used for stomach and intestine related disturbances (including major diseases such as diarrhea and dysentery). Additionally, four species with therapeutic applications were reported for the first time, whose potential can further be exploited. The great majority of the identified species was also associated with beliefs and myths and/or used as food. In general, the community was conscientious and motivated about conservational issues and has adopted measures for the rational use of medicinal plants. The ethnomedicinal use of plant species was documented in the Canhane village. The local community had a rich ethnobotanical knowledge and adopted sound management conservation practices. The data compiled in this study show the social importance of the surveyed plants being a contribution to the documentation of PGR at the national and regional level. In ancient times, medicinal plants have been used all over the world as unique sources of medicines and may constitute the most common human use of biodiversity [1, 2]. According to the World Health Organization, 80% of people in developing countries still depend on local medicinal plants to fulfill their primary health needs . Besides that, there is a global consensus on the benefits of phytopharmacy and at present medicinal plants occupy a key position in plant research and medicine. These facts associated with the progressive loss of traditional knowledge, due to rural exodus, and with the threats to which Plant Genetic Resources (PGR) are exposed, make the efforts to study and preserve PGR relevant in every respect. In this context, several conservation studies have been performed [4–6]. Like most African countries, Mozambique is an important repository of biological diversity. This diversity is used by ca. 90% of the country's population to fulfill its housing, food, energy and health needs. According to , in Mozambique approximately 15% of the total PGR (ca. 5,500 plant species) is used by rural communities for medical purposes and plays a key role in basic health care. Despite a long history of medicinal plants use in Mozambique, research on this subject is still incipient [8–10] and poorly disseminated, focusing mainly on medicinal plant markets and trade issues from Maputo province . The work presented in this article reports on the utilization of medicinal plants in the Canhane village, district of Massingir, Province of Gaza. The last survey in the region dates from 1960-70 [11, 12]. 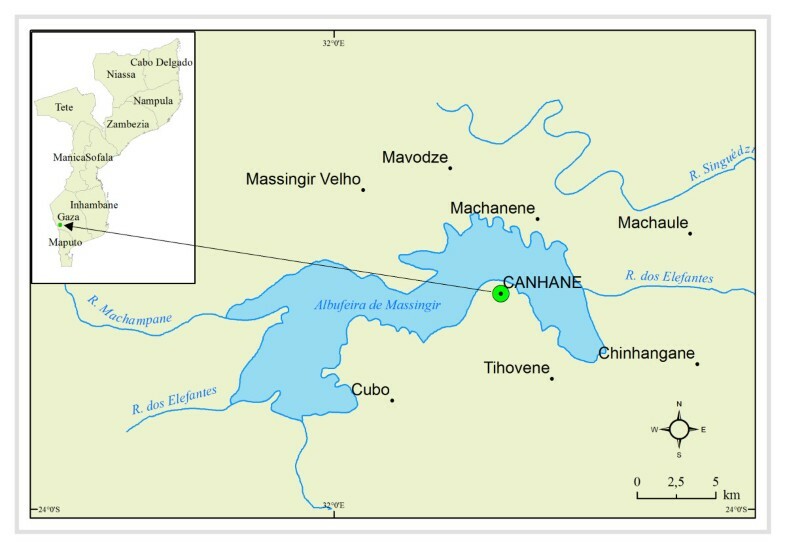 Canhane village is located 32° 09' 30" E and 24° 4' 30" S (Figure 1). With an extension of 7,200 ha, the village has a flat landscape with slopes ranging from 0 to 2% and altitudes from 95 m N to 200 m S . The climate is semi-arid with two seasons: (i) dry season (April/May to October/November), with temperatures varying from 14.5°C to 28.5°C and a maximum annual precipitation of 67.9 mm; and (ii) hot and rainy season (October/November to April/May), with temperatures ranging from 19.9°C to 32.8°C and a maximum annual precipitation of 370 mm . The humidity index may vary between -50 and -70, the negative values indicating the dryness of the region . The soils are essentially sandy with a low to moderate percentage of organic matter (0-3%) and thus poor for agriculture. Geographical location of the study site. Left: Map of Mozambique illustrating the geographical position of the Province of Gaza and the District of Massingir. Right: Geographical position of Canhane within the District of Massingir. The village has 1357 inhabitants (51% women, 49% men) the great majority belonging to the Valoyi ("Witch doctor") family from the Changana ethnic group [16, 17]. The community has poor access to water resources, health services (the closest health center is located in the Massingir village, seven Km away from Canhane), trading and communications, an obsolete energy system and an unsuccessful school system. Due to the lack of a local health center, traditional medicine plays an important role in basic health care. The main activity is agriculture, followed by livestock and fisheries. Handicraft is a tertiary activity. The major habitat types of Canhane are woodlands, savannah and grasslands [18, 19]. Currently, the vegetation communities are at different levels of degradation mainly due to human practices (e.g. production of firewood, charcoal and grazing). The over-exploitation of resources and the limiting environmental conditions seem to be associated with the decay of the resilient capacity of the ecosystems as evidenced by the occurrence of great devastated areas . With this study, we intended to contribute to the conservation and valorization of the local floristic and cultural heritage. It should be noted that the study area is of particular importance, since it is located in the heart of the Limpopo National Park, which together with Kruger National Park (South Africa) and Gonarezhou National Park (Zimbabwe) constitute the Great Limpopo Transfrontier Park and Conservation Area (GLTP). The study reports on 53 medicinal plant species and their traditional applications. The work was initiated with a meeting between the researchers, the community leader and the Commission for Social Management from Canhane Village, in order to: i) explain the aim and importance of the work and its integration on the Community-based Development Program; ii) get cooperation and permission to use the cultural heritage; iii) collect information for structuring the interviews; iv) give orientations for the selection of informants by age and gender; and v) plan the field activities. Eleven informants (six men and five women) were selected as the best traditional knowledge holders. The selection criteria were based on the size of the study site, the vegetation homogeneity and on the indications provided by the community. Due to reasons related to beliefs and myths, it was not possible to get the information directly from Witch doctors. However, it should be highlighted that most of the Canhane inhabitants belong to the Valoyi ("Witch doctor") family. Using standard methods [20, 21], the data was collected through intensive structured interviews and complemented with semi-structured interviews in local language (i.e. Changana). These included: common and local name of the plant, applications, parts of the plant used, methods of preparation and administration routes. Translation to Portuguese was validated by linguistic specialists. The medicinal plants reported by the informants were collected during three field surveys (in October of 2007 and in March and November of 2008). The team was accompanied by two local guides with a deep knowledge of local flora. Species identification was done during the field visits and by comparing voucher specimens with specimens deposited at the Herbarium of the Faculty of Sciences, Universidade Eduardo Mondlane (LMU, Maputo, Mozambique). The scientific names were confirmed through specialized bibliography [22–25] as well as the African Plant Database , Tropicos database  and the International Plant Names Index . Additional information was gathered from the study of numerous herbarium specimens, mainly from the Tropical Research Institute Herbarium (LISC, Lisbon, Portugal). A total of 53 plant species distributed over 47 genera and 31 families were reported by the 11 informants (Table 1). All the reported species grew naturally in the area, reflecting the social importance of the local floristic resources. Most of the identified plants were shrubs or trees (15 spp. or 28.3%), herbs and trees (11 spp. for each category or 20.8%), and shrubs (nine species or 17.0%). The best represented families were Fabaceae (six species), Euphorbiaceae (four species) and Tiliaceae (three species). Altogether the 53 species were used to treat 50 different human health problems (Table 1), the great majority of which (75.5%) having more than one medical application. The most cited species were Euclea racemosa (ca. 82%), Colophospermum mopane, Cucumis sp. and Elephantorrhiza elephantina (ca. 73% each species), Cassia abbreviata and Cissus quadrangularis (ca. 64% each species), Aloe marlothii, Maerua edulis, Secamone parvifolia and Terminalia sericea (ca. 55% each species) and Boscia albitrunca, Gossypium herbaceum and Gymnosporia heterophylla (ca. 46% each species) (data not shown). The number of medicinal plants and their potential applications reflect the rich ethnomedicinal knowledge in the Canhane community. Similar potentialities were found in other African countries like Cameroon  and Ethiopia [30–32] as well as in non-African countries [33–35]. Certainly, there is a lot more knowledge to exploit on the topic in Mozambique. Hermannia micropetala Harv. & Sond. Family, scientific, local and common names, growth habit, parts used, main diseases, administration route and method of preparation. 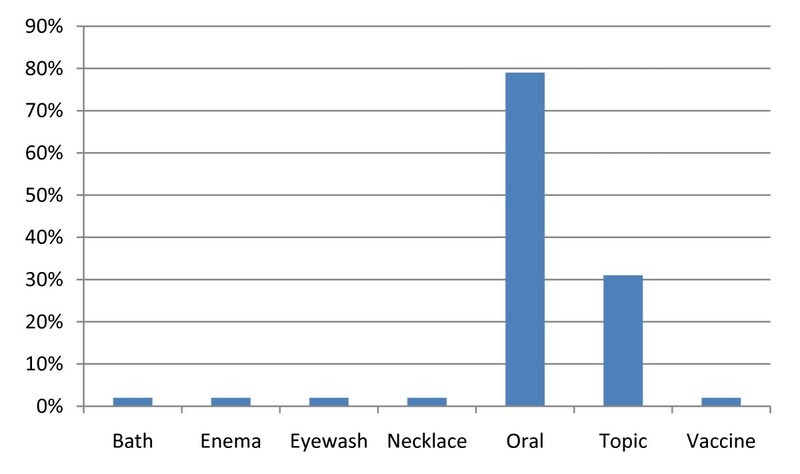 More than half of the reported species (54.7%) were used for stomach and intestine related disturbances (Table 2). Of these, almost 38% were used to treat diarrhea and dysentery, a major concern in the region. In fact, in Mozambique diarrhea has for a long time been associated with a complex array of illnesses. Amongst them, dysentery and cholera usually have a high mortality rate if not treated promptly . The use of traditional medicinal plants seems to play a major role in controlling diarrhea-associated diseases. Distribution of the 53 medicinal plant species within different disease categories (Canhane, 2007-2008). Around 23% of the surveyd species were used as analgesic, anti-inflammatory or anti-pyretic and for wound treatment, 15% for dentistry and 11% for gynecology-related problems. Approximately 9% of the reported species were used to treat ear diseases and hemorrhoids, 8% for burns, cough, debility and malnutrition, epilepsy, eye diseases and malaria, and 6% for heart problems. Only one species, Ximenia americana (ca. 2%) was used against HIV-AIDS. Thus, looking at the three major national health concerns, namely diarrhea and dysentery, malaria and HIV-AIDS a considerable number of potentialities are available for the first group (11 species), while moderate (four species) and low (one species) alternatives can be exploited for malaria and HIV-AIDS. In fact, several pharmacological studies of these three groups of human ailments are available for most of the species reported in the present survey [36–42]. With the exception of six species (Blepharis diversispina, Grewia flavescens, Guibourtia conjugata, Hermannia micropetala, Loeseneriella crenata, Zanthoxylum humile), all species under study have been reported as medicinal plants in other African countries [11, 43–46]. While the use of G. flavescens and Z. humile by traditional healers has been reported in India and Mozambique, respectively [7, 47], as far as our literature review goes, four species (i.e. B. diversispina, G. conjugata, H. micropetala, and L. crenata) were reported here for the first time. Of these, only two genera have been associated with ethonomedicine: the genus Blepharis  and the genus Loeseneriella (L. obtusifolia). Thus, these species constitute new potential sources of natural medicines. From the 53 species, nine were reported previously by  and 3 by  in studies conducted in the province of Maputo. Besides that, several other species belonging to 11 genera (Aloe, Asparagus, Boscia, Cissus, Crinum, Cucumis, Ficus, Grewia, Maerua, Secamone, Strychnos) were also reported as medicinal species . The potential medicinal plant markets from the southern provinces of Maputo and Gaza seem to be different. This may reflect the rich ethonomedicinal potential which exists in the entire country. A comparative analysis with local specific ethnobotanical literature [11, 12, 46] and complementary information gathered from the LISC Herbarium plant collections, identified 25 different plant species used for medicinal purposes (Table 3) of which only two, Combretum imberbe and Lannea schweinfurthii, are common to those reported in this study. Regarding their applications, similarities were found for C. imberbe (stomach disorders) and L. schweinfurthii (diarrhea and stomach disorders). According to the available data, C. imberbe was also used to treat schistosomiasis and L. schweinfurthii to treat tuberculosis, while in our survey they were additionally indicated for the treatment of toothache (C. imberbe), anemia and malaria (L. schweinfurthii). Because the older surveys did not specifically target medicinal plants, we believe that our data are more accurate in what concerns the applications of these two species. This fact may also explain why the great majority of the species reported 40 years ago (23 out of 25 or 92%) does not overlap with those identified in this survey. However, the possibility of loss of genetic resources and/or traditional knowledge should also be considered. List of medicinal plants (25 spp.) surveyed in the district of Massingir in 1960-70. Ozoroa obovata (Oliv.) R.Fern. & A. Fern. The great majority of the identified species (46 spp. 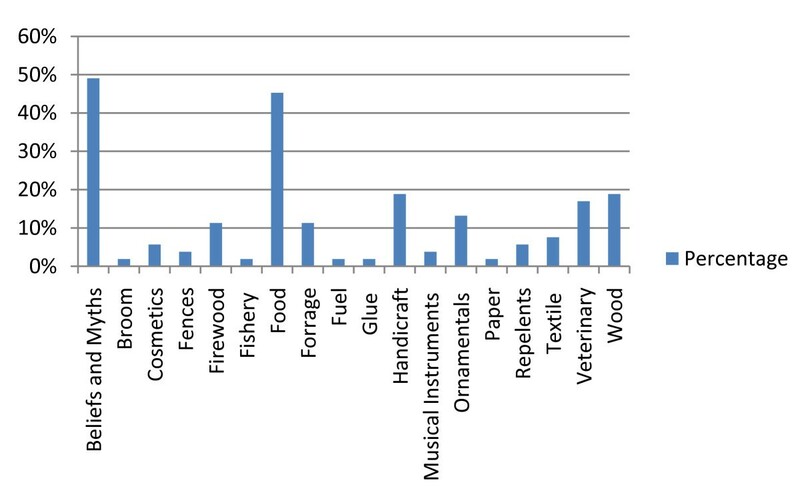 or 86.8%) were also used for other purposes than medicine (Table 4; Figure 2). The major groups of applications were associated with beliefs and myths (26 spp. or ca. 49%) or used as food (24 spp. or ca. 45%). Wood production, handicraft and veterinary were the third major class of application, with 10 (ca. 19%), 9 (ca. 17%) and 8 (ca. 15%) species, respectively. This reinforces the socio-economic importance of the reported species, placing them in a privileged position for conservational aspects and income-generating purposes. Other applications of the surveyed plant species from Canhane village (2007- 2008). The table presents a list of 46 spp. which, besides their medicinal use, are used for non-medical purposes (e.g. applications related to beliefs and myths, food, handicraft, animal diseases, ornamental). Non-medical applications. Non-medical applications of the 53 medicinal plant species (Canhane, 2007- 2008). Several plant parts were used (Table 1), the most frequent being roots (38.8%), followed by leaves (17.5%), stems (13.6%), fruits (8.8%), bark (5.8%), sap (5.8%), combinations of plant organs (3.9%), branches (2.9%) and seeds (2.9%). Regarding the methods of preparation (Figure 3), in many cases (38%) a combination of methods was used. 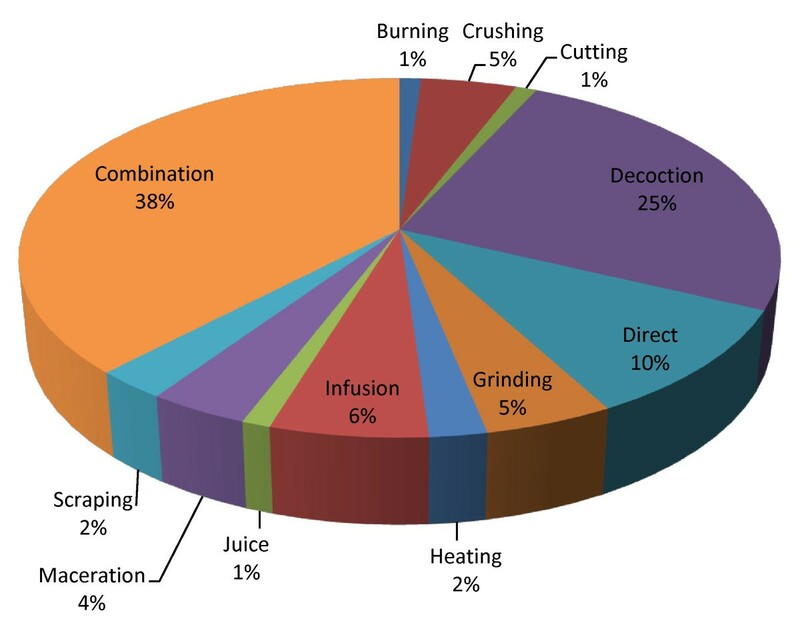 The most common method was decoction (25%), followed by direct consumption (10%), infusion (6%), crushing (5%), grinding (5%), maceration (4%), scraping (2%), heating (2%), burning (1%), cutting (1%) and juice (1%). Fifty nine percent of the medicines were administered orally, 31% topically and only 10% through vaccine, bath, enema, eyewash and necklace (ca. 2% for each mode) (Figure 4). In general, the results seem to follow the pattern of medicinal plant uses in Africa [26, 28, 49] except that in Canhane, instead of leaves, roots occupy the top position which is concordant with the results from . Consistent with the findings of [28, 49] in Kenya and Ethiopia respectively, is the lack of standardized dosage and quality control. Methods of preparation. Methods of the 53 medicinal plant species (Canhane, 2007-2008). Administration routes. Administration routes of the 53 medicinal plant species (Canhane, 2007-2008). In general, the community was conscientious and motivated regarding conservational issues and had adopted sound measures for the rational use of medicinal plants. Conservation in farms or home gardens was performed for the most commonly used plants, namely Aloe marlothii, A. zebrina, B. albitrunca, C. mopane, C. zeyheri, E. racemosa, Ficus sycomorus, Flueggea virosa, Grewia hexamita, G. monticola, H. micropetala, Sclerocarya birrea and T. sericea. Additionally, the intensity and frequency of exploitation was controlled and there were local rules to protect native plant species, particularly Adansonia digitata, B. discolor, Cissus cornifolia, C. mopane, E. elephantina, F. sycomorus, F. virosa, G. monticola, G. conjugata, Manilkara mochisia, S. birrea, and Strychnos madagascariensis. Other conservation measures included community guards in protected places to control fires and logging, mostly due to South African migrants. On the other hand, trading was controlled and confined to the village. This study shows the social importance of the floristic richness in the Canhane village, particularly regarding the significance of medicinal plants in primary healthcare. This is reflected in the great diversity of plants used for medical purposes as well as in the wide range of their applications and associated procedures. The data compiled in this study are a contribution to the documentation of PGR at the national and regional level and can serve as a basis to develop larger and interdisciplinary studies. The authors would like to express their gratitude to the Canhane community, particularly the 11 informants for their unreserved efforts in transmitting traditional local knowledge, the Canhane Community Lodge for coordinating the work with the community and for the logistics, the direction of Paulo Samuel Kankhomba Primary school for selecting the students and Non-Governamental Organization LUPA. Acknowledgments are also due to botanical collectors, António Zacarias and Ernesto Macamo, and translators, Arminda Mfumo, dr. David Langa and dr. Orlando Bahule. Thanks to Dr. José Manuel Mota Cardoso (Veterinary Hospital, Eduardo Mondlane University, Mozambique) for medical terminology and language revision, Dr. Katharina Pawlowsi (Stockholm University) for the language revision, Dr. Cristina Duarte (Tropical Research Institute, Portugal) for the taxonomic revision, and Ezequiel Correia for preparing the distribution map of the study area. This work was supported by a grant from Fundo Aberto - Universidade Eduardo Mondlane and the Swedish International Development Agency (Research Funding). The design, planning, field survey and taxonomic analysis was coordinated and conducted by TF. AR and TF performed the data processing and analysis. The taxonomic revision was done by MMR and JT. Data from other geographical regions and from 1960-70 was retrieved by MMR, JT and TF. Literature retrieval was done by AR and MMR. AR wrote the manuscript, which was revised by MMR and TF. All authors read and approved the manuscript.